"Nadamu" means entertainment and game; it is a traditional mass meeting and also an annual gala of the Mongolian. "Nadamu" has a long history. In 1225, Genghis Khan beat Hualamo. In order to celebrate his success, a grand Nadamu was held. Three men's contests were conducted at the Nadamu in ancient times, i.e. horse racing, archery and wrestling. Such activities as reading, singing, dancing, chess playing, shooting, polo, horsemanship and track and field were added to the Nadama in modern times. Nadamu has become a mass artistic and sports event participated in by people of all ages. Boys and girls can also take the opportunity to show their love, i.e. the so-called "meeting at Aobao." Now, Nadamu has become a comprehensive celebration activity integrated with ethnic sports, culture and art, trading and fairs, product expos and sales, investment invitations, tourism and sightseeing. 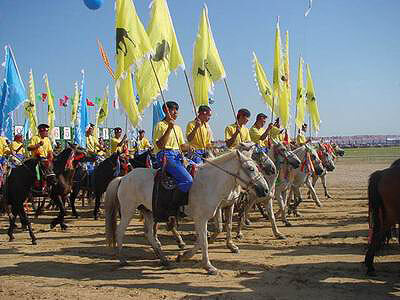 Nadamu is normally held every July and August, with Mongolian herdsmen coming from all areas come to take part and spectate. At the same time, the commercial department will take a large batch of commodities to the conference site and set up tents as provisional shops. The song and dance ensemble, artistic troupe, equestrian art troupes, film project team, and sci-tech exhibition department also go to the meeting place, which makes "Nadamu" even more appealing. Every July and August, the Inner Mongolian grassland is an ocean of dance and flowers. People use the Nadamu to celebrate good harvests and their good life.